Strandhotel Sylt. The view to fall in love with this beautiful island! A place where we offer generous living and dining within a stone’s throw from the beach. The Strandhotel Sylt is an individual high standard garni hotel in a quiet yet central location in Westerland-Sylt. The hotel is located right behind the dunes and offers direct beach access. The promenade and shopping street ¨Friedrichstraße¨ lies parallel, within sight of the hotel. The suites: The hotel has 53 spacious and comfortable rooms, a bright multi-room breakfast area, a recreational area consisting of a Finnish sauna, a bio sauna and steam room, and underground parking. Massages and beauty treatments are offered by appointment. Our hotel guests are awaited by 53 comfortable rooms and suites. 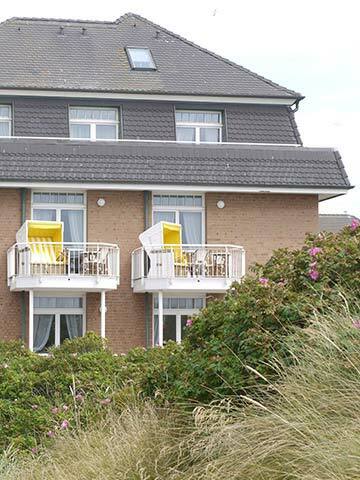 Whether you are travelling alone, in a group, or as a family, the beach Sylt offers enough space for your stay. Our studios are the ideal location for single use, with large 1.40 meter-wide beds, or for double occupancy, with 1.60 meter wide beds. For guests who prefer more spacious rooms, we offer Junior Suites. The Junior Suites come with a bedroom, a separate living room, and anadditional balcony or terrace. If you wish to make no compromises during your stay at Sylt, you can choose our suites with a terrace or balcony, some of which have sea view, or our maisonette-duplex suites, which extend over two floors. For families, our hotel also offers suites with two connected bedrooms. Should a guest wants to enjoy absolute luxury, with breathtaking ocean views from every room, the hotel offers the approx 60sqm panoramic suite. The large terrace with panoramic views of the open sea is a luxury hardly offered by any other hotel on Sylt, especially in Westerland. Leaving your vehicle on the street during your vacation? Not with us! 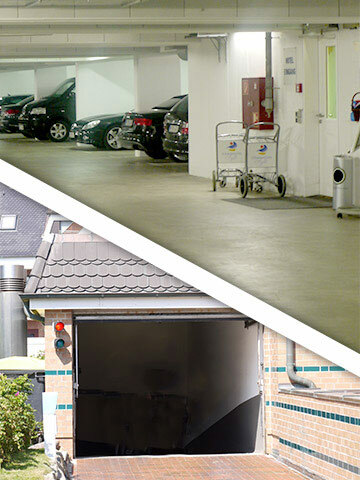 Our guests can of course park their cars in the hotel’s underground garage. For the holidays, you should relax and not have to worry about finding suitable parking. You can easily reach the parking garage from the hotel without having to make a detour. Whether by car or motorcycle, we offer this exclusive service to our guests at the Strandhotel Sylt. In our garage, sufficient transport options are available at all times, so your luggage can be easily transported to your room. Your vehicle will be protected and safe from the effects of weather, that you can enjoy your holidays and stay at Strandhotel Sylt properly. The Strandhotel Sylt thus not only has a unique location directly on the beach of Westerland, but also includes an underground garage. Our guests arriving by car particularly know this is a service to appreciate. By car, you can reach the Strandhotel Sylt from Westerland train station within 3 minutes. Of course we are available any time for reservation requests for a parking space in our underground garage. 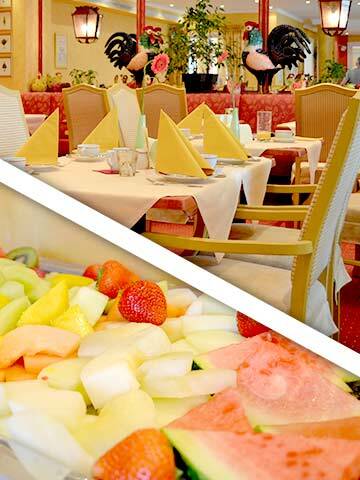 With a delicious Breakfast buffet, you can start your days relaxed at the Strandhotel Sylt. Before our guests explore the miles of beaches of the island of Sylt, a full breakfast is ready until 12:00 o’clock daily. In our breakfast room, which consists in part of a winter garden, we offer our guests a varied breakfast buffet. Various tasty and freshly prepared salads are available additionally. Once well-fed, you can explore the island completely relaxed, and your vacation can begin. As a hotel directly on the beach of Sylt, fresh fish variations are of course not absent. The breakfast buffet at the Strandhotel Sylt includes, among others, fresh fish variations. Along with the relaxed breakfast buffet, our guests at Strandhotels Sylt can upon request receive a complimentary sparkling champagne.